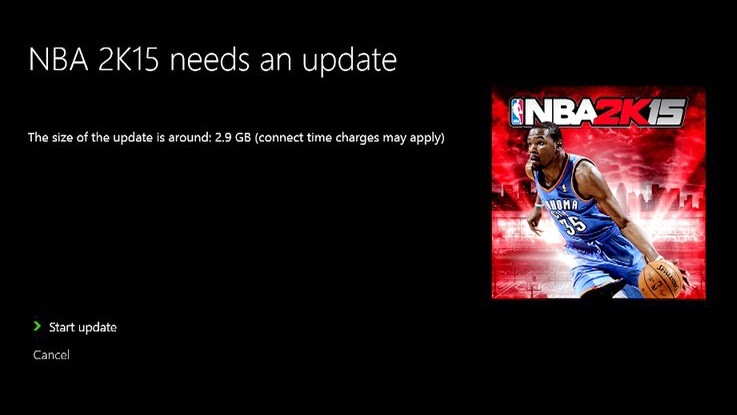 Newest NBA 2K15 update finally comes to Xbox One. NBA 2K15 players on Xbox One will find the game's third major content update has gone live today, introducing many of the same features PC and PlayStation 4 players received two weeks ago. Full patch notes are available below. Continued improvements have been made to the face scanning process. Please ensure you have plenty of balanced lighting (natural light is best) for best results. A number of improvements have been made to the MyPARK Championship experience. Get out there and represent your Park! The following players have received updates hairstyles/beards: Chris Andersen, Carmelo Anthony, Dwight Howard, Martell Webster, Josh McRoberts, Deandre Jordan, Marcin Gortat, Kyrie Irving, Iman Shumpert, Michael Williams Carter, and Xavier Henry. The following players have received new or updated head scans: historic Shaquille O’Neal, Damian Lillard, Larry Sanders (goggles), Otto Porter (prescription goggles), Steve Nash, and Jordan Hill. Rajon Rondo now has a new body type. Updated the Atlanta Hawks uniform to match the look for the 2014-15 season. Updated the Toronto Raptors uniform by reducing the thickness of the red trim around the arms. Updated the referee uniforms to match the look for the 2014-15 NBA season. Improved lip sync and facial animations for a number of the Real Voice interviews with Doris Burke. Fixed an issue where the commentator would occasionally reference an on-screen overlay when one was not being displayed. Fixed a case where the game would occasionally hang when scrolling by the created players tab in the Roster Creator. The shooting form and shot base animations are now correctly coupled when scrolling through them in Edit Player. A League Members screen has been added to Online Leagues, with the ability for admins to kick users from the league as well as the ability to award a win to the user of their choosing. In Online Leagues, a clear indication of who won/lost playoff games is now provided when viewing the results of games around the league. When accepting an Online Leagues invite on the Main Menu, the user will no longer lose functionality after accepting an invite, then canceling out of the Retrieving Content Data dialog. When spectating or in Got Next in the Jordan Rec Center, the quarter and time remaining will now appear in the score bar. Created/generated players will now have their hot zones updated when their position changes. Users with very low teammate grades in All-Star Team-Up/MyPARK games will be removed from the current session. NBA players now have appropriate wingspans/body lengths listed when editing them in Edit Player. Users are now able to change where the NBA logo is placed on their headband when viewing it in Accessories in the MyPLAYER Store. Updated the Adidas Ankle Brace to match its real-life counterpart (velcro now faces out). Fixed an issue where parties of 5 would sometimes get split up when searching for All-Star Team-Up game. Records will now be shown with the correct values when loading into quick matches online. Resolved a rare issue where the game would randomly hang during the Dunk Contest at All-Star Weekend. The correct players names and scores are now shown during the tiebreaker round in the dunk contest at All-Star Weekend. MyTEAM users who quit out of the game as soon as the clock hits 0, but before the game flow officially ends, will now receive their earned MyTEAM points. Fixed a rare hang that would occur if the user attempted to Rematch during a very small window at the beginning of the Halftime Report. (PC) Support for 21:9 resolutions has been added. (PC) Support for adjusting controller vibration has been added into the VideoSettings.cfg file located in your %APPDATA% folder. Several improvements made to defensive movement to make it more responsive. Fixed several issues preventing shooting fouls from being called at a high enough frequency for both the user and CPU. Fixed 3PT line recognition for jump shooters to prevent them from stepping over the line when attempting 3PT shots. Pass speeds have been increased to reduce "floaty" passes. Increased the AI's usage of 3PT shots to better match real life NBA statistics. Implemented a casual walk-up state and new back-to-basket walk launch to get rid of the "hunchback" walk-ups. Also made it easier to dribble walk in general. Disabled technical fouls due to excessive timeouts in online games to prevent griefing. Fixed overpowered behind-the-back dribble moves. Addressed several cases of control unresponsiveness in the dribbling system. Tuned interior and contact shot success for more predictable outcomes. Reduced contact dunk frequency for Posterizers in all game modes. The AI will now evaluate more options rather than always doing "auto-putbacks" off of offensive rebounds. Several improvements made to balance offensive and defensive rebounding. More impactful penalties instituted against "zig-zag" 3PT exploit. Corrected a case where block inputs were being dropped near the basket. Increased the frequency of reaching fouls. Tuned defensive closeout speed and effectiveness. The shot meter is now enabled during free throw situations. Reduced the frequency of moving screen violations. Fixed an exploit in which the user could continually engage and disengage from the Post to get to the basket. Changed the default setting for Defensive Assist online to 50 to help with on-ball defense. Re-worked the shot fatigue system to take more factors into account to better simulate real life. Tweaked the ‘Beluba’ Camera to make it more playable in transition and during free throws. Fixed the ability to throw long touchdown passes by alley-ooping to the receiver from the backcourt. Force receivers to play standing catches on check-ball passes. Fixed an issue where a user's pass release type request was being overridden during fast breaks. Fixed several cases of rebounding goaltends being called too frequently. Improvements to passing and catching into the post. Made passers more aware of defenders behind them when selecting pass animations. Fixed Play-call messages not appearing when calling a play in the Jordan Rec Center. Prevent post players from auto pump faking from dropsteps. Delayed the AI's decision to pass on pick & rolls until the roll animation has launched. Improved Deny Ball movement when Out of Position. Improved the responsiveness of the Right Stick defensive Quick Steps. Addressed a rare issue where the user wasn’t able to move his defender during an inbound situation. Fixed on-ball defense facing when out of position and really close to the ball handler. Prevented off-ball defenders from going into a shot contest if an on-ball teammate is already in one. Made it easier to control your player during the 2K Camera flip transition. Improved post shot selection for AI-controlled players to better match their tendencies. Reduced the frequency of steals in perimeter body-ups. Fixed the logic for the AI dribbler passing to the roll man in pick-and-roll situations. Removed dribble drive stutter that was occasionally playing in the wrong situations. Improved Points of Emphasis logic for late game situations. Player attributes now dynamically update in the Substitutions menu to demonstrate the effects of hot/cold streaks and injuries. Improved logic and spacing for players in the Triangle freelance offense. A number of other smaller changes have been made to address issues as well as enhance the user experience. Improved shot awareness and raised shot percentages for teammates in MyCareer to make them more effective. Several improvements made to the Teammate Grade evaluation. Fixed an issue where tattoos equipped while in the Practice Gym failed to apply to the player when playing the next NBA game. Fixed an issue where an incorrect scene would sometimes play when the user’s team wins a playoff series against a rival NBA player. During the offseason, your favorite team should no longer try and recruit you if you are already on that team. Users can now preview sounds in the Arena Media menu prior to purchasing. Fixed a rare case where a player not on the team would appear in scenes with the MyPLAYER. The ‘Chase Down Artist’ badge should now unlock at the appropriate time. The requirements for the ‘Dimer’, ‘Acrobat’, ‘Scrapper’, ‘Spin Lay-in’, ‘Post Hoperator’, and ‘Charge Card’ badges have been lowered to make them a little more attainable. The +/- stat will now display proper values after portions of the game have been simulated. Corrected an issue where the MyPLAYER was sometimes not the offensive player in the post scoring drill. Fixed an issue where pre-game rituals would occasionally not trigger before a played game. Corrected a case where the camera would sometimes look at the other team during a speaking huddle. The MyPLAYER will now wear his team’s uniform during the Three-Point Contest at All-Star Weekend. The MyPLAYER will no longer wear his in-game accessories along with his casual clothes in the Sprite commercial. The Rising Stars and All-Star games will no longer take place in the 2014 all-star arena starting with year 2 of MyCAREER. The Hall of Fame environment has been completely re-lit to increase the visual fidelity of the experience. Addressed an issue where some save progress would be lost in an active save when loading a custom roster and playing a game outside of MyGM/MyLEAGUE prior to entering it. Fixed an issue where user-approved trades (via Trade Approval) were occasionally not processed when accepted during the offseason in MyLEAGUE. Tuned generated draft class creation to create more variety with respect to body scale proportions (e.g. shoulder width, wingspan, etc.). Tuned DPOY formula in order to get more accurate award recipient finalists. Fixed an issue where a player’s injury recovery time could dramatically drop when aggravating an existing injury. When a player worsens an injury by attempting to play through it (e.g. Sore Knee -> Torn ACL), the injury duration will now be updated to match the new injury. Your Trainer will now inform you of exactly which body part he is worried about when uncovering an injury concern on a draft prospect. Corrected an issue that was restricting some players from signing contract extensions in-season despite having the appropriate number of bird years. Players that are focused on Injury Rehab will no longer aggravate existing injuries during Training. When prompted to Load / Download a draft class, the menu will now also populate with classes built by your fellow community members. In MyGM, the user will no longer receive an offseason owner goal to not lose a player to free agency when that player is already signed for the next season. In MyGM, your owner will no longer ask you to upgrade a position where you already have a star player when you have another position in need of a clear upgrade. In MyGM, fixed an issue where upgrades that affect durability affected only the miscellaneous durability instead of the durability of all body parts. In MyGM, the user will no longer fail the ‘Keep Morale above X’ goal is the related player gets injured and his morale drops below the threshold as a result of the injury. In MyGM, CFOs with the ‘Bully’ badge will no longer lower their own Trust due to the badge. The game will no longer hang when trying to finish the offseason with 4 or less players on the roster (What are you thinking anyhow?). Addressed an issue in the Gameplan where the rotation would reset when leaving a team-specific gameplan for a team that had 15 players on the roster. Head Coach hirings/firings are now tracked in the Transaction Report. Fixed a bug where the social media messages from different Power Rankings personalities would be incorrect when starting with a Fantasy Draft. The latest title update is now available on Xbox One and comes in at 2.9 GB in size.